(April 5, 2003) -- LBPD says someone stole a pet bird -- a macaw named "Tahoe" (believed similar to the photo of another macaw, right) -- from the owner's shoulder while the owner was walking down the street. 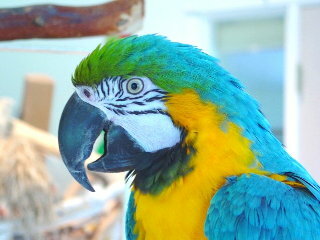 Tahoe, age 13, has a blue, yellow and green head. Yes, she answers to her name, "Tahoe." This isn't Tahoe, but an illustrative photo provided at our request by a bird lover. Tahoe has a blue, yellow and green head. Photo: Copyright © Connie Pavlinac. 2003. All rights reserved. Used with permission. This especially heartless theft took place in broad daylight -- 10:00 a.m. on April 4 -- in the area of Pacific Coast Highway and Lemon Ave. when the suspect allegedly ran up to the victim and snatched the bird off the owner's left arm. The suspect is described as a 17-year old male Hispanic, about 5'2" tall with a thin build, wearing a green hat. The bird is valued at roughly $2,000. Anyone with information about this crime is asked to call LBPD at (562) 435-6711.